After having an international and bi-lingual fellowship in the historic center of Rome from 2000, God called us to cast our nets on the other side of the boat and start fishing afresh by moving the church into our own neighborhood. 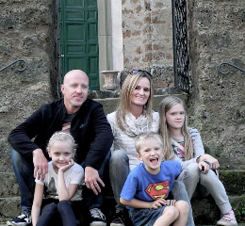 Starting over with a handful of people in our living room in 2010, Calvary Chapel Rome is now located in the shadow of one of Rome’s most troubled and broken down neighborhoods called Tor Bella Monaca. Urban social issues including crime, drug and domestic abuse, poverty, anxiety, and depression are among the many issues stressing the area. But God has done a mighty work in just 3 short years of our new church plant. With everything in Italian God is using us not only to reach Italians, but also to equip and disciple them, and send them out into the harvest field of daily life. The Lord is using simple efforts such as English and guitar lessons, concerts, children’s ministry outreach, our Food Bank distribution for the needy, as well as our newly started second hand clothing market to give us practical ways to love people, bless them in Jesus’ name, and build deeper relationships that we might plant the seeds of the gospel and see people come into the kingdom of light through Jesus. Last year we started a cell group out on the sea and are praying for God’s timing to start our 3rd church plant. With only less than .01% of some 60 million people being biblically born again, we pray that God will light a fire and raise up Spirit filled, Bible believing churches across this nation. Our desire is that the Holy Spirit would come and powerfully reveal to multitudes the one true and living God who can radically change lives, even a nation, by way of a personal and intimate relationship built on His loving Grace and the power of His Word.